Hampton, Va (June 21, 2014) – Well the one thing no one wants to see on race day is rain and let me tell you what I am starting to feel I have bad sports juju this year when it comes to that stuff. We have had countless softball games cancelled, a few touring races cancelled, a fair share of our local oval drag racing events (Wacky Wednesday’s at Langley Speedway), as well as a few nights at my local short track. I have lived in this region for quite some time now so I know rain is going to be something we are constantly fighting, lucky for us this past Saturday was not as bad as I thought it was going to be. Waking up at 7am because you have to be at your normal job by 8am on race day is bad enough, but waking up to a steady pace of rain makes things even worse! Every race day is an exciting one for me, it is a time for me to get away from my day job, head to the track and believe it or not relax! Over the weekend we had a special visit from the NASCAR boys to my little hometown of Hampton, Virginia. 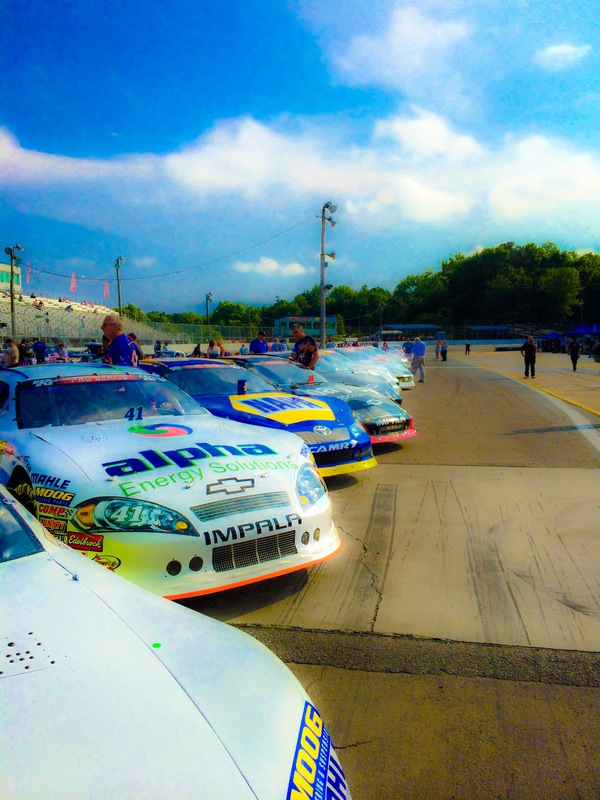 On deck, the K&N Pro Series East ladies and gentleman! Going into this week I was really excited to see some of the names on the entry list. Of course rookie sensation Ben Rhodes, Kenzie Ruston, Gray Gaulding and what should of been Lee Pulliam! Rhodes has been on a tear this season winning four races (Greenville, Iowa, Bowman Gray, Five Flags) before coming to Hampton, with three of those victories being back-to-back-to-back! Kenzie Ruston who had an incredible run at Langley last year before running into trouble was coming into this season with a little better equipment. I was really disappointed when I got to the track to see no Lee Pulliam! For those who may not know, Pulliam was driving the #11 machine out of the Hattori Racing stables before that operation was shut down to focus more on their Nationwide car. I thought this meant Lee would return to the ranks of Late Model racing and dig himself out of the hole in the national points he was in due to traveling with the K&N series. However, Top Gun Motorsports offers Pulliam a chance to run a part time schedule. 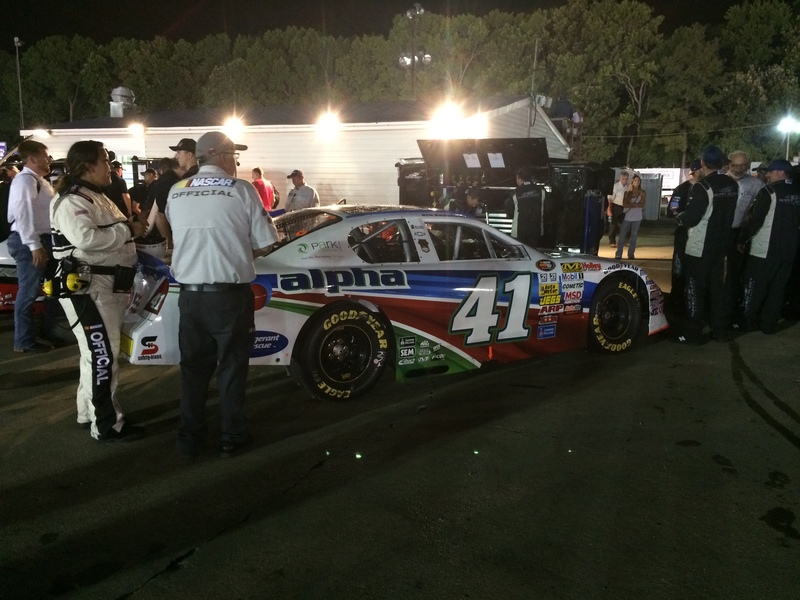 Pulliam would debut for the team at Five Flags Speedway, start 12th and finish 19th due to an incident on the track. 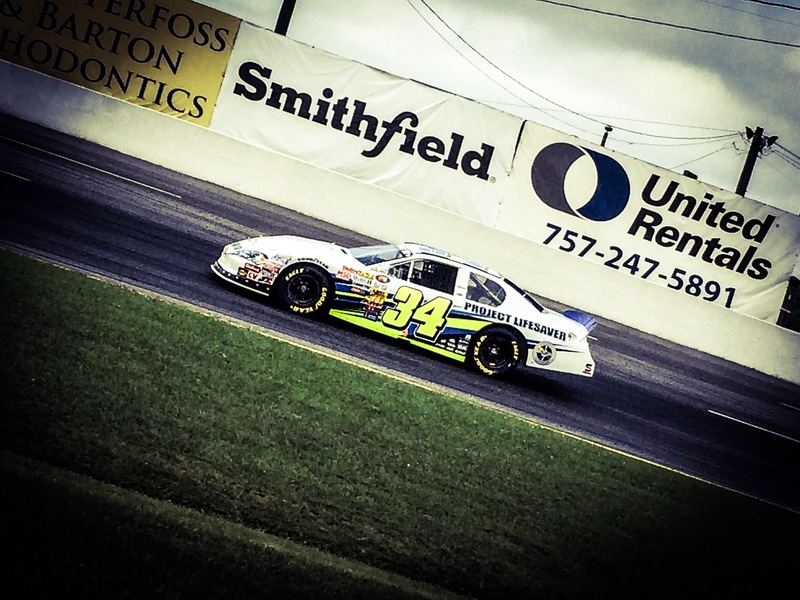 Word was that Pulliam was on the entry list for this weekends race, but to my dismay was not at the track. Wonder what its going to take to get this man to race at Langley! Scott Heckert in his 34 machine was able to jump to the top of the speed charts late in practice, he would also earn his first Coors Light pole award during qualifying with a 15.869 (89.836) followed by Rhodes, Drake, Hayley & Ruston to round out the top five. Oddly enough the Late Models tend to get around the track quicker, I know the late models are made a littler different, tend to be a little lighter and can carry more corner speed. Either way the field was set for what I was hoping for a good race. When the green flag waved it didn’t take long for cars to start running into each other as tire pressures were still coming up, drivers were still getting into the swing of things. From what I saw Daniel Suarez and Pena made a little contact going into turn one, Pena’s car got sideways while Makena Bell was trying to check up the 33 of Brandon Jones runs into the back of her! Everyone drove away with just cosmetic damage and were able to return to the race. 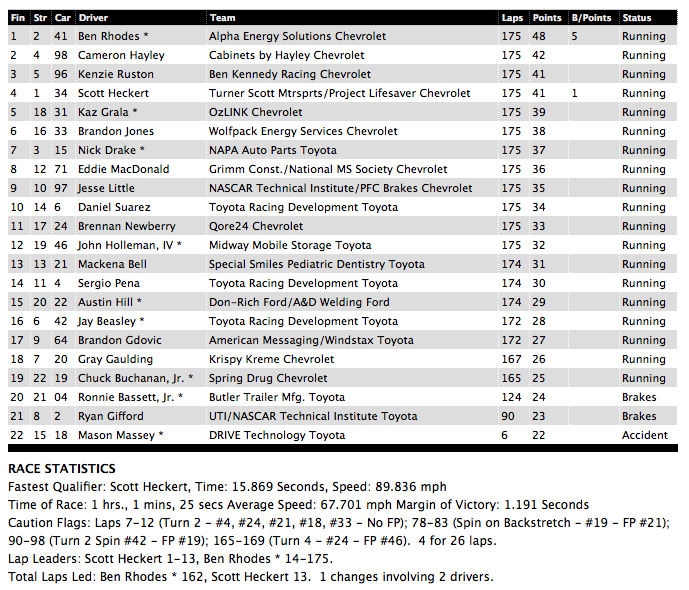 For the most part it was kind of a strung out race, Heckert lead early and put just a few car lengths over Rhodes and the rest of the field. However, I was wired in with both Rhodes & Ruston all night and Rhodes was just riding there the first few laps saving his equipment. There was a few decent battles going on farther back with Gdovic trying to work his way up, just kept catching lap traffic at the wrong time, Gdovic was actually black flagged for what K&N officials called rough driving. If this was the incident that I remember seeing Gdovic and Suarez were trying to pass the slower car out of two, for position mind you, Suarez made it three wide and some contact was made. Found out later an incident happened in the pits that caused Gdovic to be held for a few laps which pretty much halted his run to the front which has to be disappointing for him specially at his hometown track! 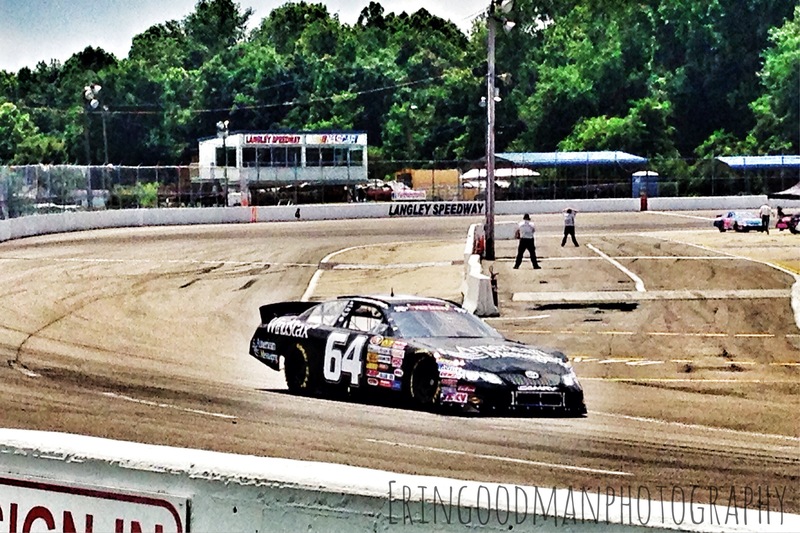 Gray Gaulding ended up running into some engine trouble midway through the race. Sounded like the engine was missing or a plug wire came loose. What ever the problem was he brought it to the attention of his crew, they got him fixed and back out on the track to finish under his own power. Gaulding would eventually finish eighteenth, almost ten laps down but under his own power! Another issue on the evening, with the exception of a very few cars, was the fact there was no second grove! This forced the majority of the race to be a single file line, kind of reminded me of my days back in elementary school, single-straight-silent lines just minus the silent part. There isn’t much you can do besides wait for restarts where the field is bunched up and lines up two wide. Kenzie Ruston & Cameron Hayley had the best battle of the night up towards the front battling for second and third! During the nights first caution Ruston reported her car was a tad bit to loose when she got back on the throttle, she told the crew not to worry because she felt it would get better as the race went on. She was right, as the night went on the car tightened up, much to her dismay, the car got to tight and halted her little run in second position, resulting in a third place finish. 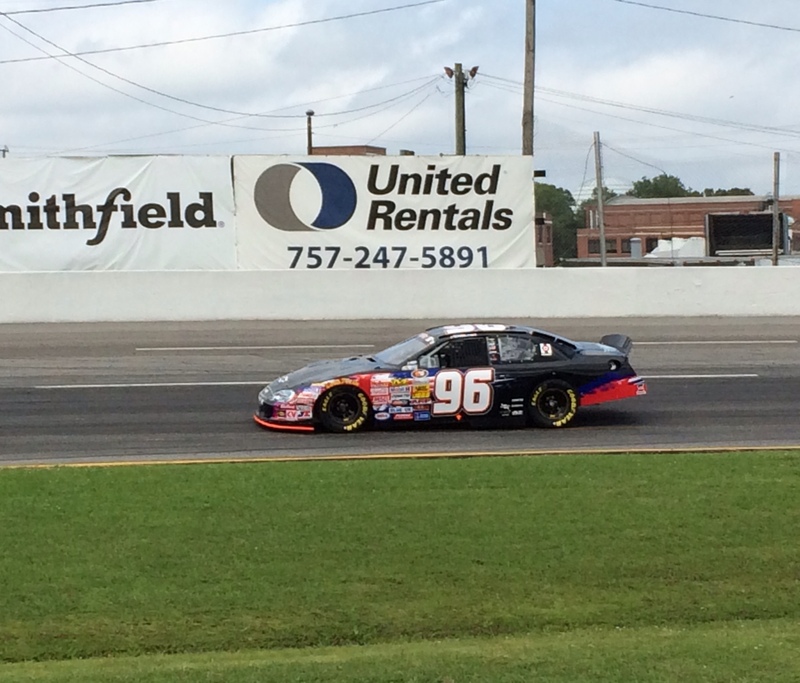 Pole sitter Scott Heckert and rookie Kaz Grala would round out your top five. Langley marked Rhodes fifth win of the season but an even more impressive fourth victory in a row. During the post race interview Rhodes did end up admitting he felt the pressure from Hayley and Ruston and had to crack the whip to make sure they kept their distance. With the victory and bonus points for most laps led factored in Rhodes now has a 71 point advantage over Cameron Hayley going into the next event! These ladies and gentleman will have the next weekend off as the series moves out of Virginia and heads north to the giant paper clip that is New Hampshire for Granite State 100. For more information you may check out the series page at http://hometracks.nascar.com/series/KN-Pro-Series-East or follow NASCAR Hometracks on Twitter.